"Jane's Addition" was the 13th and final episode of the 3rd season of the Daria TV series (episode number 313). It first aired on MTV on August 18, 1999. This episode was written by Glenn Eichler. When Mr. O'Neill assigns his students to create multimedia projects, Daria and Jane decide to ask Trent to contribute some music. They plan to ask him during a gig at the Zon, but Jane becomes intrigued by a young man named Tom. During the Spiral's break, she and Tom go off to get some food, leaving a rather put-out Daria behind to speak with Trent, who agrees to help with their project. Unfortunately, neither development works out well for Daria, as Jane starts spending more and more time with Tom, while Trent isn't putting any effort into his part of the project. This leads to tension all around, with Daria resenting Tom for what she perceives to be his horning in on her friendship with Jane, Jane -- who can't understand why Daria is so upset -- angry with Daria for the way she's acting towards Tom, and both girls upset with Trent for his lack of effort. Eventually, Daria and Tom come to an understanding regarding Jane, with Tom convincing her that he's not out to steal Jane's friendship; in fact, according to him, Daria is practically all that Jane talks about. They don't exactly become friends, but the tension is mostly lifted. At school, Daria and Jane turn in their project, a so-so effort that's upstaged by Upchuck's entry... all thanks to Trent, who (not surprisingly) failed to fulfill his commitment. In the end, Daria and Trent reconcile over Trent's blunder and they remain friends, even though Daria is now keenly aware of Trent's slacker tendencies and his inability to stick to commitments, and they both covertly admit that a romantic relationship would never work. Afterwards, she, Jane, and Tom share a pizza and each others' company... a sign of interesting times to come. Classical piece "Also Sprach Zarathustra" by Richard Strauss (aka the bit from 2001: A Space Odyssey with the monkeys) plays during Upchuck's multimedia presentation -- over a clip of his face. Boy has an ego. This is the last episode where Daria crushes on Trent, and we were warned that this would happen back in "Lane Miserables". It's also explicitly clear -- if episodes like "Pierce Me" hadn't made it obvious -- that Trent was aware of the crush, as he tells her "I guess it wasn't such a great idea for us to get together" ('pretending' to mean the project). In a 2006 interview with Kara Wild, Glenn Eichler said that Tom was always meant to date Daria in the future. 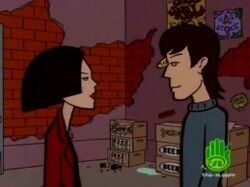 The reason he starts as Jane's boyfriend was partially because Glenn felt Daria would need to grow on a high school boy for him to ask her out, meaning "he would need to spend a fair amount of time in her company BEFORE they started dating"; partially to "allow us to explore and test Daria and Jane's friendship", as happens in this story. On Hulu, the episode is mistitled as "Jane's Addiction", the name of the band from which the title was derived. This page was last edited on 13 April 2013, at 00:51.